Whilst it is true that dogs display 'intelligence' it should never be confused with human intelligence or emotions. Motor patterns are inherent in a dogs genetic make-up and it is the particular motor patterns that make a pointer stop and point, that make a border collie eye and chase, whilst a blue heeler will bite the livestocks heels and a livestock guardian will do none of these things. Whilst training your dog of any breed will build on these genetic motor patterns, it will not create them and this is an important distinction. Dogs present many motor patterns of behaviour for all kinds of situations. This article discusses the predatory motor patterns as this is an important subject to understand both for the way your livestock guardian behaves, making him trustworthy with the livestock, and how his behaviour confuses predators and disrupts the predatory motor pattern they are engaging in. There are a number of steps in the predatory motor pattern, and a kill is only able to be achieved if all the steps can occur in sequence and without interruption. What we often interpret as emotions in a dog are really reactions to stimulus, with motor patterns of behaviour resulting. The dog positions himself in the environment in relation to structures and the prey he is after. 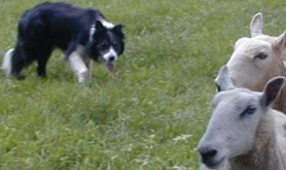 Let's use the example of a dog in the wild who has come across a herd of sheep. The dog locates the sheep, examines the perimeters and finds a good place to begin the hunt from. The dog now crouches low and begins to examine the actual herd, eyeing them to spot if any in the herd look weaker, somehow infirm or very young. Dogs don't just rush wildly into a herd of animals hoping they will grab something along the way, they eye the herd and single out one animal to target. The dog now begins approaching the chosen livestock in a crawling manner, remaining as undetectable as possible for as far into the stalk as possible. This is important to get the dog as close to his prey as possible before the chase begins to give him the best advantage. Once a target is chosen, the dog may eye the herd for some time waiting for the target animal to move more to the edge of the herd, or for the herd to be completely ignoring the dog if they scented the dog and were wary. The chase is initiated with the dog concentrating only on the chosen target - the dog needs a high level of concentration to perform the chase through to the next stage with the minimum of energy expended. The most common place for this is the jugular, although a variation often seen is head shaking. Most commonly the dog then begins to rip open the abdominal area of the prey. This is an important part of the motor pattern, as the prety cannot be consumed until it has been dissected. Internal organ such as liver, kidney and heart are highly nutritious and the dog will attempt to eat these parts early as their is still the chance of disruption and losing the entire meal. The completion of eating the prey. So which of these parts of the sequence do livestock guardians possess? Answer = consume. What this means is that for a livestock guardian to eat, the meal must be caught and dissected for them. Watching very young livestock guarding puppies will allow the careful observer to note that they do not 'play predator'. 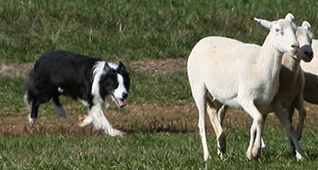 The main issue reported in raising puppies without other adult guardians is the chase part of the sequence, however they are not so much practising the chase of a predator as the chase motor pattern needed to protect their livestock, and may be misguided in practicing on the livestock if they are not given adult guardian dogs for supervision. It is also important to note that these concepts are complicated and in reality the stages in the motor pattern sequence are hypertrophied or minimised, whilst in breeds such as the border collie, some stages are hypertrophied whilst other stages are exaggerated to get a dog that will round up without continuing to a kill bite. What do these breed traits mean together to show the behaviour of a good guardian? Not all livestock guardian individuals behave the same way - why not? How do livestock guardian puppies tend to behave? How much dog behaviour is true intelligence and how much is driven by motor patterns?